Summer is flying by, as usual. While I haven't been getting much blogging done, I have been keeping busy! Between teaching online, prepping activities for next year, adding lots of resources to my Teachers Pay Teachers store, and, of course, spending time with my family, there hasn't been much down time. 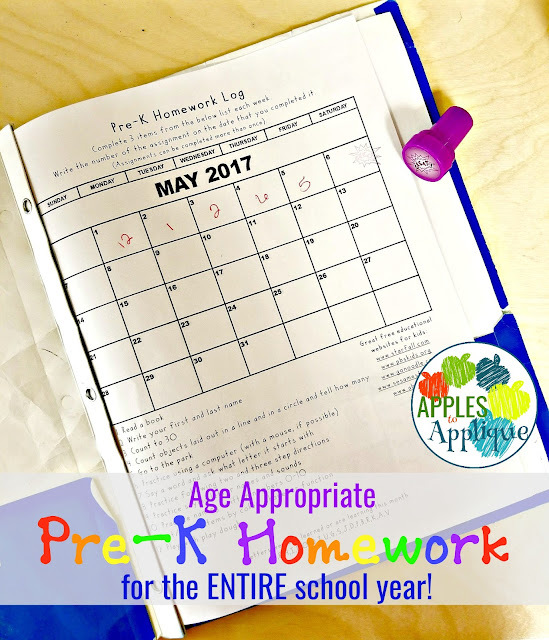 One of the resources I have been working on is a year-long age appropriate homework system for Pre-K! I am really excited to share this resource with you! I spent all last school year developing it and testing it out with my students. It got the stamp of approval from parents and from other teachers and paras, so I hope it will be useful to some of you, too. Teaching Pre-K has its unique challenges. I want my students to be and feel a part of the school community, which is not always easy considering they only attend for half a day. (Speaking of that, watch for a post about organizing a classroom for two half-day classes coming in September! UPDATE: Click here to read about how I stay organized!) Another challenge is that Pre-K is not always taken seriously as "real school". It's considered to be more like daycare. One of the things that irks me is when people say we're not doing real work, we're just playing. First of all, play is developmentally appropriate, and so important! Children learn so much through play! Secondly, while we do spend a fair amount of time in structured play, we do a lot more than just play in Pre-K. I created this homework system to help address these two issues. My building has a school-wide homework policy, so I wanted my students to be a part of that--and thus, more a part of the school community as a whole. After all, my job is to prepare these kiddos for kindergarten. Getting them in the habit of doing homework will help establish a strong foundation for their future schooling. Also, assigning homework helps parents to see that we are doing a lot more than "babysitting" their children, and encourages them to get invested in their child's education. However, the challenge came in creating assignments that are age-appropriate. It would be easy to just list a ton of homework assignments, but would they really benefit the students? The activities I assigned in this system cover a host of skills, from literacy and math to self-help and motor skills. While many of the activities repeat from month to month (such as reading), others change and grow throughout the school year. They are specifically designed to address kindergarten readiness skills. The best part, though, because I believe so firmly in the importance of play, is that lots of the activities include an aspect of play! Some of the assignments include "play pretend" or "go to the park", because I want parents to know the importance of these types of activities. Another benefit of this system is that it is incredibly quick and easy for teachers to implement and for parents and students to use. That was important to me. I didn't want homework taking up 30 minutes to an hour every night. That in and of itself is not developmentally appropriate at this age. I also didn't want homework becoming one more overwhelming thing for families to take on, so I kept it very simple. 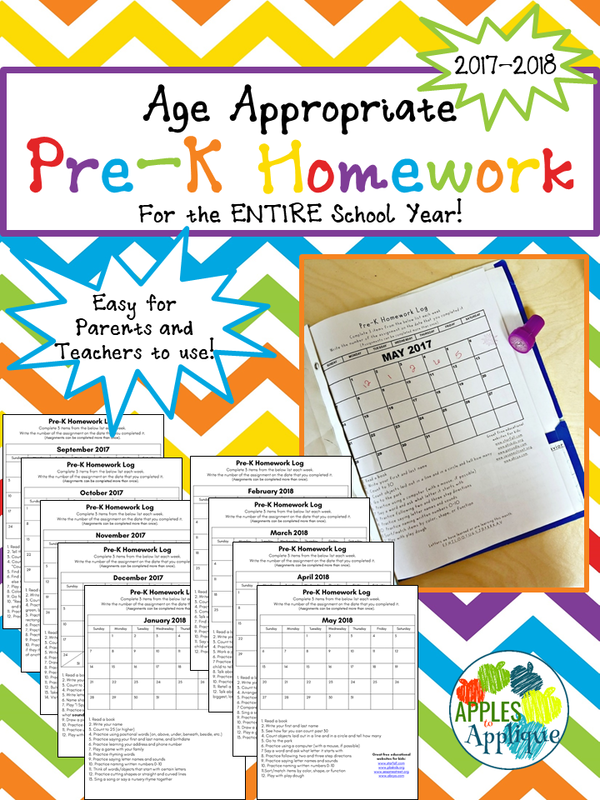 Get the homework calendar for August FREE by visiting my TPT store and downloading the preview! 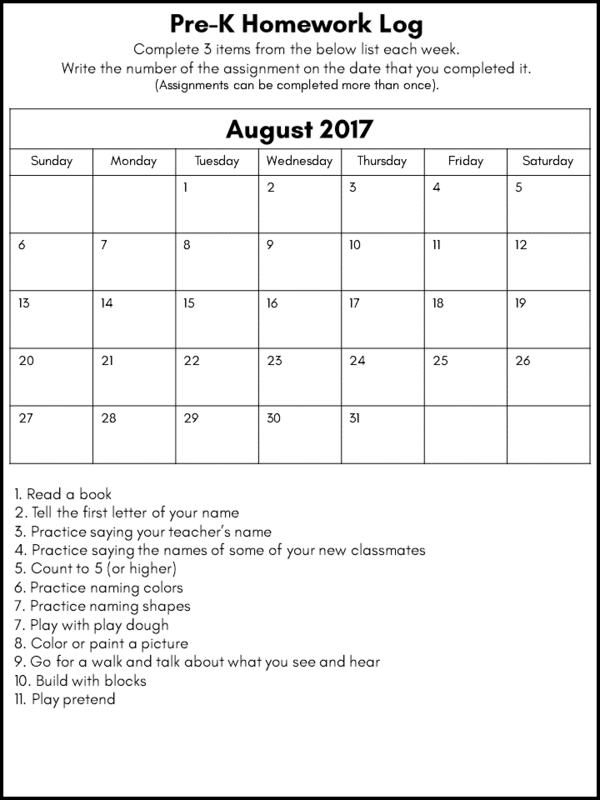 There is a calendar with a list of assignments for each month (August 2017 - June 2018. At the end of the school year, it will be updated for the 2018-2019 school year). Parents are requested to complete 3 items with their child each week, and to simply write the number of the assignment on the date they completed it. They can do assignments more than once. There is a lot of room for flexibility! For certain parents, I tell them how to adapt the activities for their child. For example, if their child is already counting past 10, I encourage them to count beyond that. If they are not yet able to count at all, I recommend they count to 5. I give my parents a lot of liberty to do what is best for their child. To check out this homework system, go visit Apples to Applique on Teachers Pay Teachers. 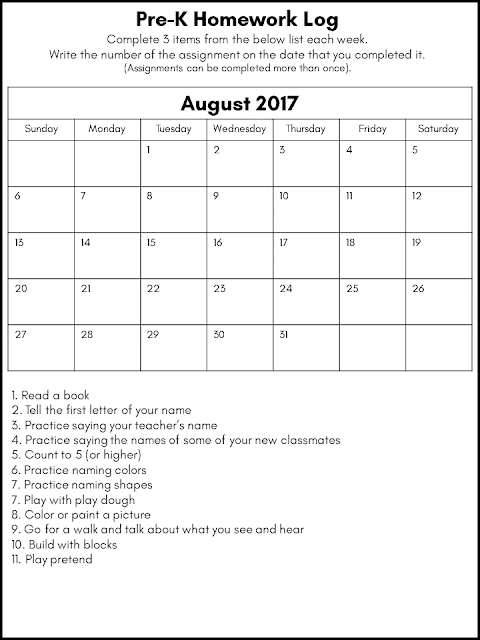 Download the preview on Teachers Pay Teachers to get August's homework calendar free! I would love to hear how you handle homework in your early childhood classroom!